I've been thinking a lot recently about Musician Second Class Gerald Cox. Jerry was a guitarist who lived in East Moline, Illinois, only a few cornfields away from my current home. He enlisted in the Navy as a musician, and, after boot camp and music school, reported to his band in Hawaii. I never heard him play, but he must have been good; his band had a reputation as the best military band in the Pacific. Jerry's time in the Navy was short. He and his entire band died at their battle stations on USS Arizona as horror rained from the skies over Pearl Harbor on that date that still lives in infamy. MU2/c Gerald Clinton Cox died at the age of 19, 33 years before I enlisted as a musician. Yet, he is my shipmate. He and I--and all who have served in the U.S. Navy as musicians--share a bond of service and sacrifice that is unbreakable, permanent and, to those who have never served in uniform, incomprehensible. Memorial Day is set aside so we may remember those who gave their all. In our eyes, they are giants, but, in their times, many were kids. Arizona's Band 22 was made up of Midwestern farm boys and New York city slickers. The average age of the bandsmen was 21. They called each other "Brick," "Swede,""Mad Russian," "Flatfoot Floogie." Yes, they were young, but the boys in the band were men at their battle stations in Arizona's ammunition hold. Sleep peacefully, Jerry. You too, Swede, Brick, Flatfoot. Every year, on a Friday afternoon in May, a year since it happened last, it catches me by surprise. It happened again today. I was sitting at the computer, windows open to let in the breeze of a warm spring day, when I heard a drum cadence. When the roll-off began, I'd reached the front door. And by the time I reached the front yard, a 50-piece marching band was formed up in the street in front of my house, playing "Anchors Away." Just as it does every year, the local high school marching band was practicing for the Memorial Day ceremony. Since I live behind the school, I am the audience, reviewing stand and guest of honor. And every year, the band's first piece is "Anchors." Maybe it's random. Or, maybe it's because the band director knows I'm a former Navy musician. But, every year, the sudden concert surprises me. It also surprises me how I snap to attention without thinking. Who moved John Derby's chops? John Derby is practicing diligently for his first Navy Musicians Association reunion. So diligent is he that skipping a day brings on godlike visions of damnation and retribution. Read about it at Who Moved My Chops? Driving to my first Navy Musicians Association reunion in 2006, I didn't think I'd meet anyone from my first band, Navy Band San Francisco. Well, I figured Doyle Church, my old LPO, would be there--he's the NMA secretary--but I imagined we'd be the only guys present from those distant days in the City by the Bay. Oh, how wrong I was. After greeting Doyle in the hotel lobby, I was carrying suitcases into my room when a familiar voice called my name. I went to the door and there was John Hanson, my San Francisco Dixieland partner, looking no different than he did in the '70s. That night I was jamming in the lounge when I looked up from the piano and saw, his hair still as red as it was when he led the Showband, Charlie Sweet. The next morning at dance band rehearsal, Frank Kemp was sitting in the trombone section. We took a break, I went to the coffee mess for a cup, and there was J.J. Connor, Navy Band San Francisco's Assistant Bandleader. Every year, I run into someone else from that band. Bob Marquart and I have renewed our old friendship, and, this year, I've already heard from two more San Francisco alumni, drummer Dave Whitaker, and guitarist John Derby, who are planning to come to San Antonio. I can't say that I left my heart in San Francisco, but I left a lot of friends. And, thanks to the NMA, I'm finding them again. I hadn't played for years before attending my first Navy Musicians Association reunion. I worried incessantly about my ability to play and eventually posted articles about my pre-reunion practice regimen. John Derby has taken such public self-flagellation to a new level. 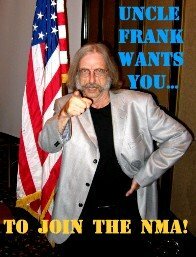 He's created an entire blog about his musical preparations for his first NMA reunion in June. To relive the agony and insecurity that make preparation for your first reunion a period of nerve-wracking self-debasement, visit Who moved my chops? Like me, John stopped playing sometime in the '90s, but it's clear he'll be ready for our get-together in San Antonio. He's already figured out the three most important things to bring to a reunion of the Navy Musicians Association: your suitcase, your axe and your excuses. I'm watching "Victory at Sea" on DVD. Robert Russell Bennett's orchestrations of Richard Rodgers's themes, so familiar to Navy musicians, are even more masterful in the context for which they were written. I just finished watching Episode 23, "Target Suribachi." It begins with preparations for the invasion of Iwo Jima, the convergence of American ships offshore that crucial island, the range-finding, all scored with Bennett's typical expertise. Finally, the bombardment starts. And when it does, the music, for the first time, stops. For 22 1/2 episodes, music has underscored every action, every victorious parade, every humiliating defeat. But now, the only sounds are the roar of the big guns, the scream of airplane engines, the thunder of the explosions that tear apart the island in preparation for the landing. No doubt, Rodgers and Bennett could have come up with musical accompiment for this. But they had the sense not to. Letting the sound of battle tell the story makes this scene the starkest of the series. I heard of the death of Larry Brown, the assistant bandleader when I was stationed at the Newport band in the '70s. Having grown up and served in the old-school, "cumshaw" Navy, Larry could get his fingers on things that eluded normal supply channels. Legendary was the battleship-sized desk in his office, the spoils of some nefarious deal he cooked up. It was the most majestic and imposing desk on the entire base, coveted by all senior and flag officers at NETC Newport. After Larry's retirement, his desk remained onboard, a special perk for the MUs who followed him as Assistant Bandleader, Navy Band Newport. Larry is gone, but, for all I know, his desk is still on active duty. Funeral details for MUCM Larry Brown, USN (Ret.) will be posted at the Navy Musicians Association website when they become available. Regular attendees are used to the routine, which changes only slightly from year to year. Newcomers, however, wonder how it all works. -- The Registration desk may be closed when you arrive. No biggie; join in the fun and sign in when you can. -- "Combo" means free-wheeling jazz/Dixieland/bebop in the lounge. Rhythm section gear--drums, keyboard, amps--will be permanantly set up. Times given are estimates; whenever the mood strikes and the instrumentation allows, the jamming will happen. -- Check the gig board for changes. Scheduling changes, updates and snafus can, and will, occur. -- The Registration desk is open through Friday, to accomodate those who cannot attend the entire reunion. A loose Tuesday schedule is given for those early birds, like me, who like to get a head start on the fun. 0900-1500   "Best of San Antonio Tour"